A paradigm shift in Anilox transfer technology . . .
eCell (HD) HDLE Anilox Transfer Technology has been specifically developed to assist printers obtain higher print quality, improved definition, and take full advantage of the latest CTP, HD, NX, Flat-Top Dot plate techniques. This advanced high definition anilox transfer technology has fundamentally been designed and based on the proven principles, practices and successes of the industry standard yCell (Y-Hex) 60 degree cell pattern. However, in essence, the eCell is a modified elongated version which consists of two differential screen counts (vertical and horizontal) which create a unique elongated cell shape. This extremely advanced anilox transfer technology has been strategically refined and developed using a combination of advanced high definition laser engraving techniques – MBA (Multi Beam Anilox), MAD (Micro Anilox Displacement), Custom Cell (Cell Design Software) – into our new-aged Black Pearl ™ ceramic coating which is robotically applied, ensuring optimum quality. eCell (HD) anilox transfer technology now allows printers to select and specify higher screen counts than that of their conventional yCell (60 degree) cell counts. Printers can, however, still maintain the same or higher volume ranges without the need for plate screen changes. The uniqueness of this elongated high definition cell shape allows for ink to be transferred more fluently, dramatically improving the the amount of ink transferred to the substrate and visibly improving the density, opacity and overall print quality. Higher Screen & Solid Combination Coverage. Cleaner and sharper highlights and mid tones. CTP, HD, NX, Flat Top dots, and stochastic plate technology ready. 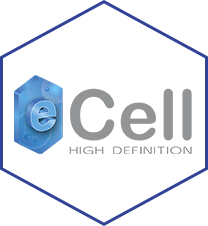 High Performance eCell (HD) AVM Certified Cell Tech. New generation coatings using latest P-Coat techniques & technologies. Easy to maintain and clean due to the elongated cell shape. Extended Nano Doctor Blade ready surface technology. Designed to run at faster press speeds, low-cell turbulence technology.